Saturday we went to visit one of my daughters that lives north of us in Bountiful, Utah. 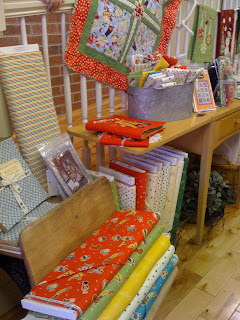 Not even 5 minutes away from her house is one of the nicest quilt stores in our area - Quilter's Haven. 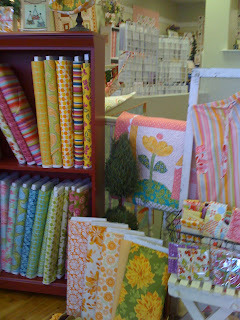 The store is light and bright and their displays are really fabulous. The fabric selection is great, too. Wouldn't you know I forgot my camera! I did have my phone so I used that to take some pictures. Not the best- but it was my phone or nothing. 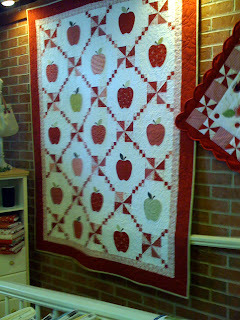 I love this apple quilt that they have hanging in the front of the store. 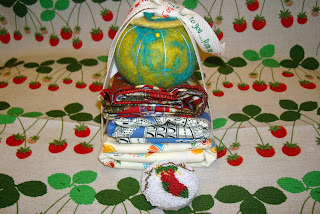 You can't really tell but the fabric of each apple is different and it is so well made. I think this was my favorite quilt in the store. 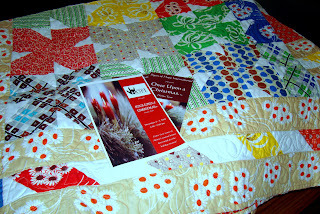 Edit - This quilt is a version of a pattern from Cyndi Walker's book "Spotlight on Scraps" . A fabulous book - I have it. 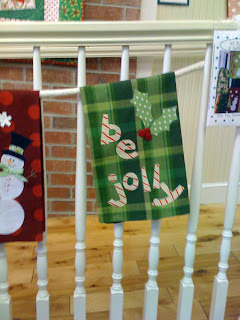 Decorated dish towels all hanging in a row and so cute. 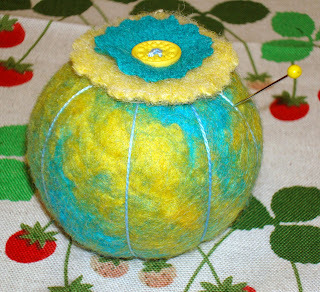 They had the sweetest giant cupcake pincushion. The picture really doesn't do it justice. This looks like I took the picture in black and white. 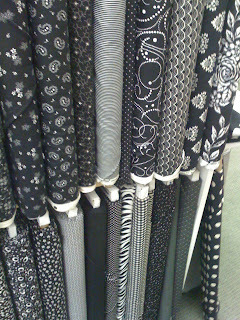 But no, it's all black and white fabric. They had a fabulous selection. I know Jackie is doing a black and white challenge for 2009 and I really need to join in. She even started a new blog for the challenge- go check it out. Look how cute that yellow goes with the black and white. Red is the obvious color I would pick as a compliment color with black and white but I'm thinking I really like that yellow a lot. This machine is beautiful - a work of art. I wanted to pick it up and make a mad dash for the door. 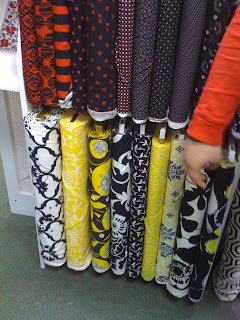 In the front of the store they had some newer lines of fabric displayed. 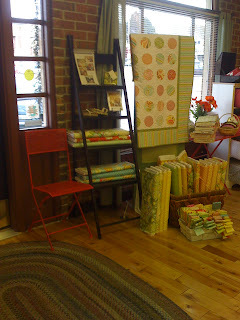 They had every single color way of Sandi Henderson's Farmer's Market fabric - I hadn't seen all the colors up close before at one store. 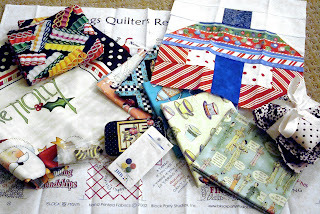 I had to get a few fat quarters. 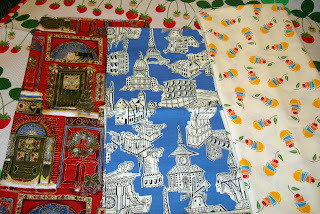 I could have sworn I saw some of Sandi's fabric on a TV show the other night (pajamas) but she said it was only a similar print. This was taken next to the front door. 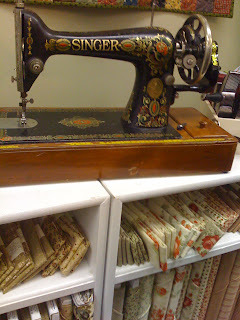 Everywhere you look in this store there is something wonderful and beautiful. If you ever get the chance to drive near this area, you've got to stop here. The store is right off one of the I 15 exits - don't ask me which one though, but it is easy to find, and worth it. If you click this last picture you can better see the "man chair" next to the door - I thought that was funny. But smart. When I was 17 my parents moved from Pennsylvania to Utah. There was not enough room in the moving truck for a few boxes. Left behind were our very vintage Christmas ornaments and my old toys. 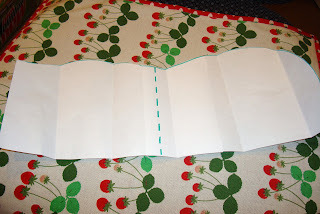 I've mourned those things and think about them every Christmas. Over the years I've replaced some of the toys but I've yet to replace the ornaments. Maybe someday. 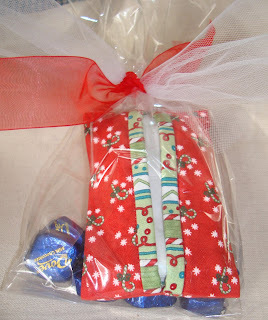 This year I decided to decorate our tree simply with plain Christmas balls and fabric ornaments. 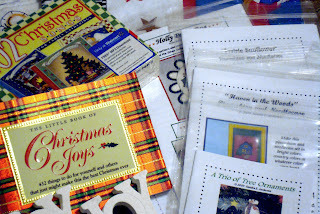 Over the weekend I started making the new ornaments. 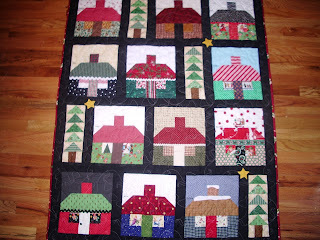 I made Nordic inspired houses - above, with this pattern at Orange Flower patterns and tutorials. Warning: Very small pattern! I made mine slightly bigger. 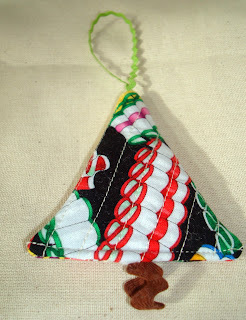 The finished size of my ornaments is 6" high x 3" wide. 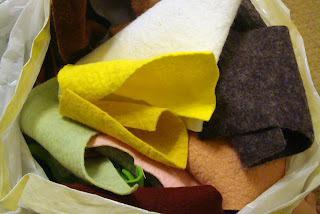 Here they are all puffy and finished with the ends stitched shut after stuffing. I used cotton fabric for the main house part with a linen look - it's much cheaper than real linen for this application and looks nearly the same. 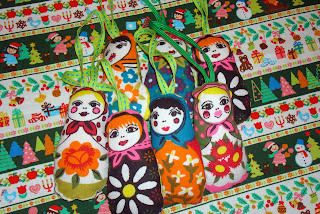 I also fussy cut my matryoshka fabric (was an unused curtain panel) to make stuffed babushka dolls to hang on the tree. 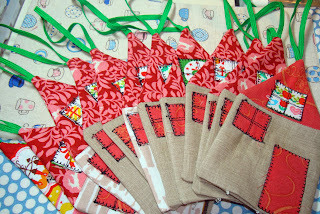 I had made sachets with this fabric previously and liked them so much I decided to make ornaments with them. 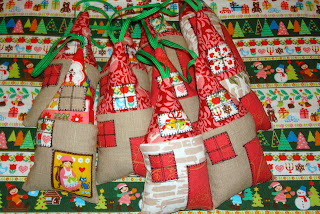 I also cut out the scraps of my Michael Miller fabric in tree shapes and then quilted them instead of stuffing them. 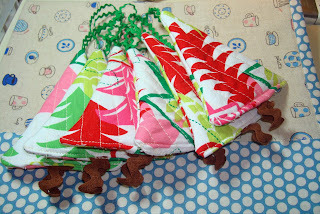 I looped brown rick rack for the tree trunk and used narrow rick rack for hanging. This is only a start. 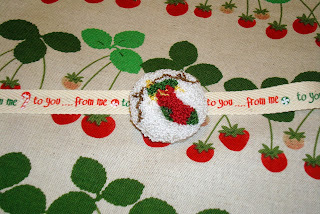 I realize I need to make lots more and I want to make some to share, too. I planned on decorating my tree Friday so I have work to do. 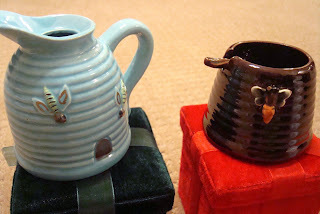 I know, I know, I haven't blogged in a few days. Isn't it awful when your life gets in the way of your hobby? So terrible. 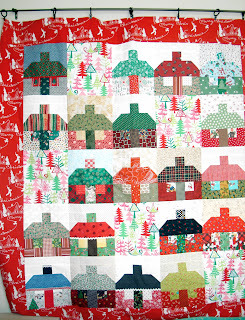 Tricia, a local gal, great quilter and sweet new friend wins the prize for "First Christmas Cottage Quilt Completely Finished"! (unless there is one of you that has kept quiet about yours?). 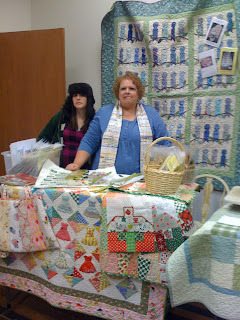 Tricia had it quilted by a woman that quilts for me too, from time to time. 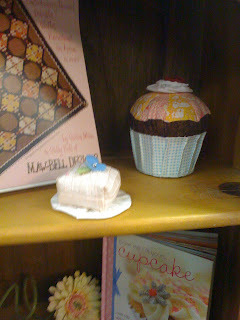 It is quilted in candy kisses. 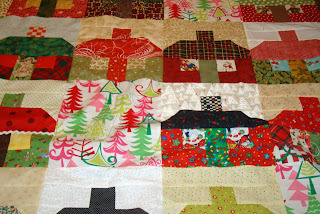 I love the flying geese trees and the sashing. It pulls it all together. So fabulous Tricia. 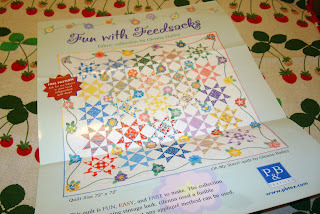 She's going to bring it to our quilt group meeting on Tuesday and show it. I absolutely love it. 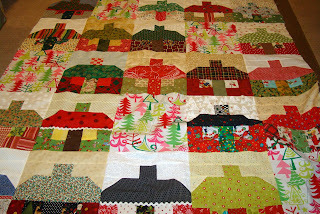 So my first cottage flimsy is done. 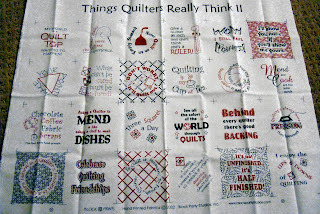 But I haven't taken it to the quilter. And I found out I missed the deadline to submit it to the local Festival of Trees. 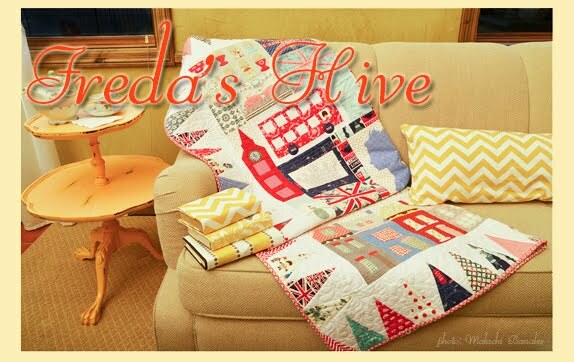 I will be sure to donate one of the quilts I make next year. 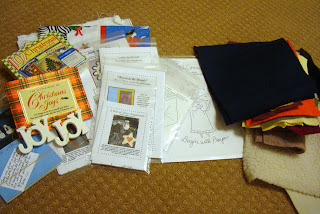 I have some other ideas for the other 2 cottage quilts I'm making but I've had to set that aside for a bit. You know how that goes. 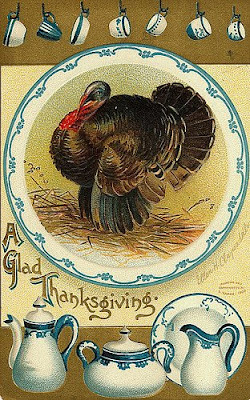 It is such a crazy busy time of year. Yes it is Friday. 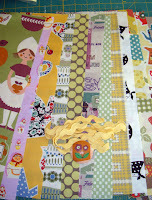 I thought I'd show 2 of my vintage stash fabrics. 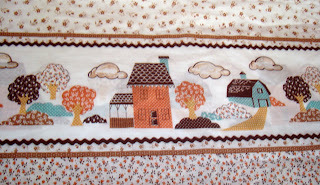 This one has a rick rack pattern in the border print design. 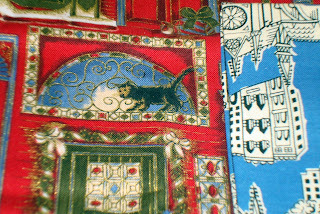 Two different prints meet the house border. I love the colors and the peaceful neighborhood scene. 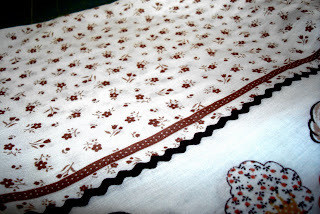 It is a really unusual and lovely fabric. 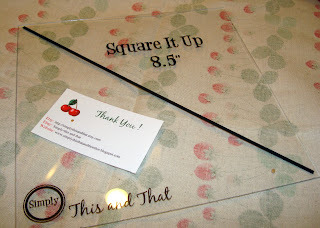 I originally bought it to cut up and put pieces in my bag kits but I really hate to chop it up. 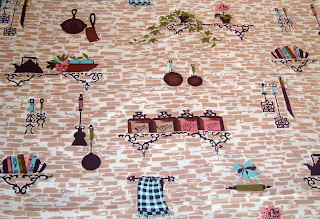 Here is one of my vintage kitchen prints. I like the brick and I will most likely fussy cut the piece into projects. I can use the brick when I make "other" cottages, too. The blue in the fabric just pops out at you. 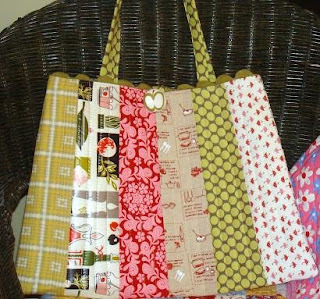 I've got some new bag kits in my Etsy store (or will today). I sold out so quickly last time and put some more together this week in case there was someone that still wanted a kit. 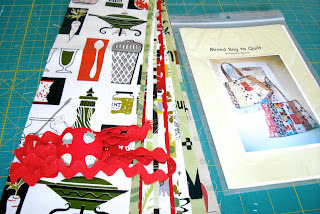 I really enjoy making the kits and deciding what fabric to put in which grouping. Thanks to those that purchased my last ones!